Cart abandonment emails are a big opportunity for store owners to recover otherwise lost revenue. There are many reason why a customer leaves your store with a perfectly good cart filled to the brim, but alas it happens. Follow-up Emails allows you to automatically communicate and engage your customers using an email program that follows up with potential customers that leave your site without completing their purchase. You will first want to navigate to Follow-up Emails > New Email. Add your Follow-up name and create your Email Subject. Then add your email content. 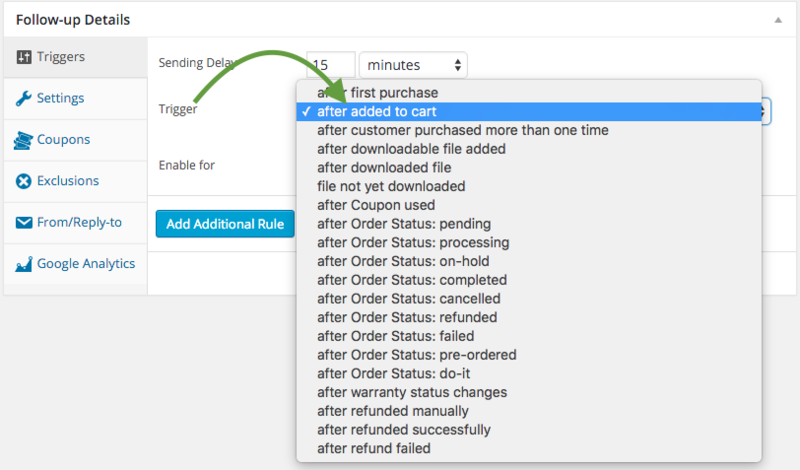 Once you have added your email content, and the variables you wish to use, set up the after added to cart trigger. Go to Triggers, and set your delay and choose the appropriate trigger. Please note that new variables will appear for use, and can be referenced here, for use on abandoned cart emails. These options will allow you to create a diverse set of follow-up emails across all the products you sell. Now you want to make sure that this email is only sent to people who did abandon their cart, but not to those who purchased the product. In order to do that, go to: Settings > Remove on status change and enable this feature. We’ve got some more documentation on setting up the body of the email, including adding variables to help you further. See this post for more tips on creating Cart Abandoned emails.